Here is a list of our current products, be sure to click on the product images to view a more detailed image of each product. 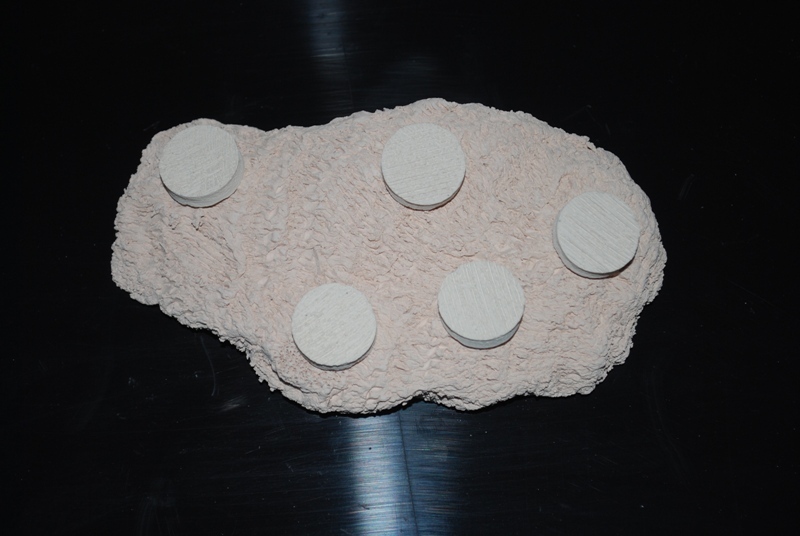 Our coral frag disks and plugs require no curing. They can be used right out of the bag. They are ceramic and reef safe. We have been using the same material since 2006 and many of our original pieces are still in aquariums today. Our disks and plugs work great for lps, sps, soft corals and polyps. The surface is rough to the touch and extremely porous. 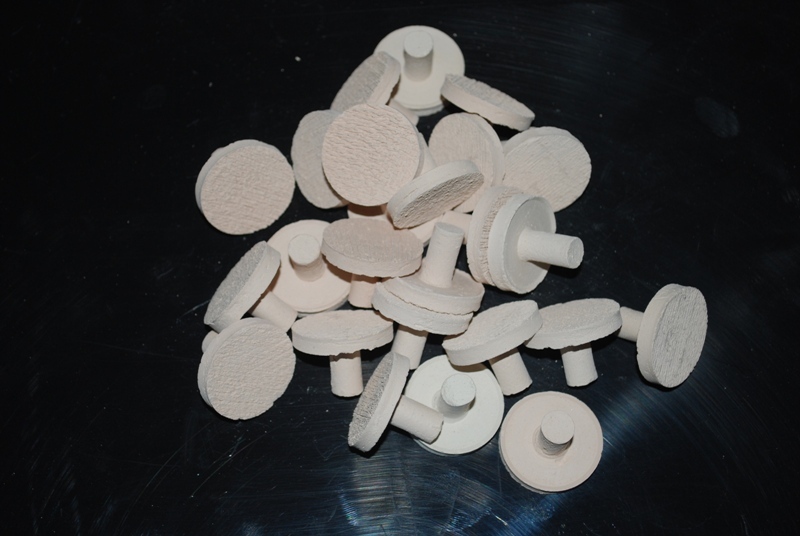 They will not crumble like concrete/aragonite plugs and do not require an additional six weeks of curing before you can use them. Super glue gels holds tight. Our plugs and disks both have stems on them. They are designed for use with our Frag Station coral frag holders. They also fit easily into standard egg crate. They are light but heavy enough that they will not get blown around like many of the plastic plugs on the market. They coralline up quickly and the post can be removed by many common fragging tools. Plugs have a 3/4" mounting surface. Disks have a 1 1/4" mounting surface. Our commercial plugs have the same qualities as our plugs and disks with a few added features. This plug is heavier. It has a thicker mounting surface with a hole added to it for mounting branching sps corals. The stem is longer as well. 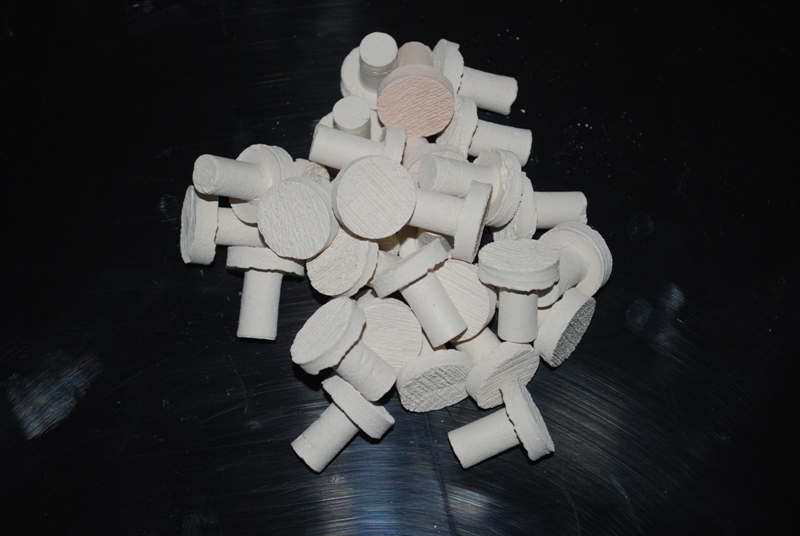 This plug is designed for the commercial vendor or large scale commercial coral farmer. The added weight of the plug helps to keep the coral stable in high flow conditions. This plug is only available for store or farm use by licensed commercial farms or stores. Quantity discounts apply. This is a special order item. Donuts are ceramic pieces that are great for growing out larger corals like leathers, zoanthids, lps and sps. 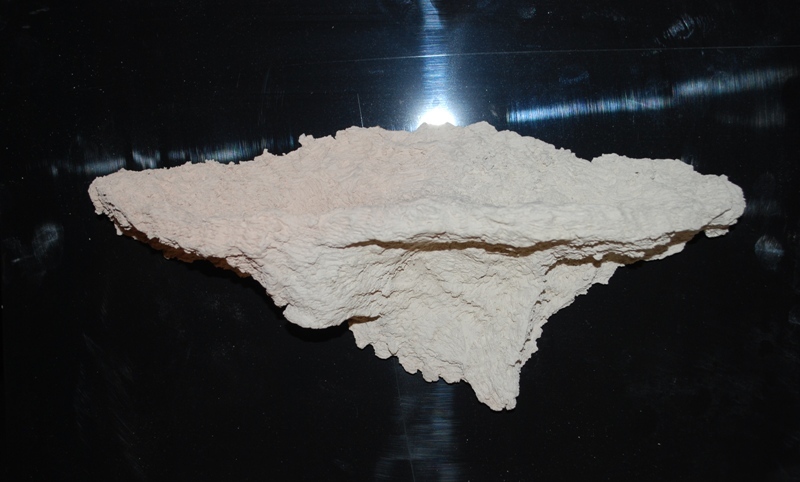 It has a hole in the middle that can be fitted with a small piece of rock or coral frag. Plugs and disks also fit in the hole. It is also a nice alternative to rubble rock. Some hobbyists do not like using frag plugs or disks. They prefer the more natural look of the donut. 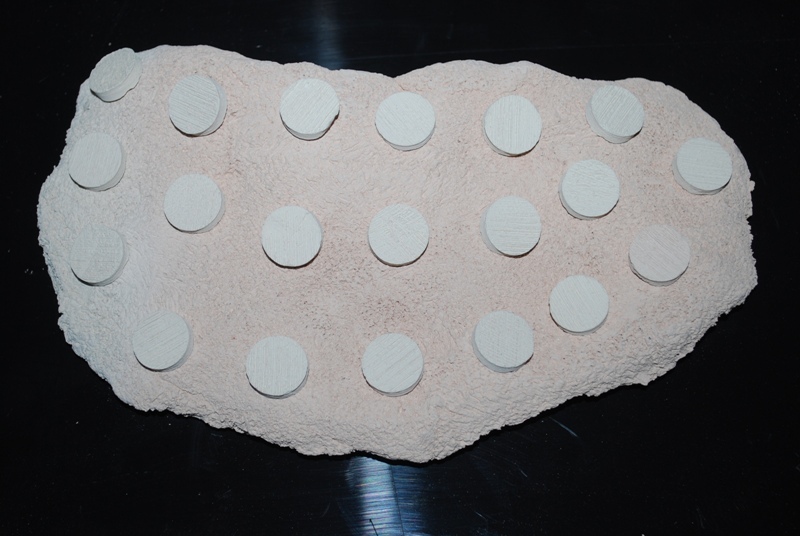 Once it corallines up and the coral encrusts over it is hard to tell that it is artificial. They can be stored dry and unlike rubble does not need to be stored in a sump. Ever have a coral frag you just purchased get lost in your rockwork or get blown into another coral? Most if not all of us have. During acclimation we tend to put our corals on the sand bed or somewhere loose in the rocks until it adjusts to the conditions of the aquarium. Then a snail or random blast of current knocks it out of place. The Frag Station helps prevent that from happening. With the Frag Station at the bottom of the tank or mixed into your rockwork there is a place to safely put your frag until it is ready to be mounted permanently to your reef structure. If it saves just one coral from being lost it pays for itself the first time you use it. Many hobbyists permanently mount a favorite coral right to the Frag Station. As the coral grows it encrusts the plug on its own. Once the plug has encrusted with coral you remove the plug and replace it with a new one. The coral will quickly grow over the new plug. This gives you constant coral propagation with minimal effort. And since you are taking a plug out of the colony that has grown around the plug it will re-grow even faster than if you just put one small frag on the plug to grow. With the Frag Station you can have a mini coral farm in your display tank. This saves money over time. There is no need for an expensive frag tank and all the extra equipment and electricity that comes with it. It is also a much better alternative to egg crate. While egg crate has its place in our hobby and works well in frag tanks we feel it should never go into a display tank. Frag Stations come in three sizes. Five, Ten and Twenty hole sizes. 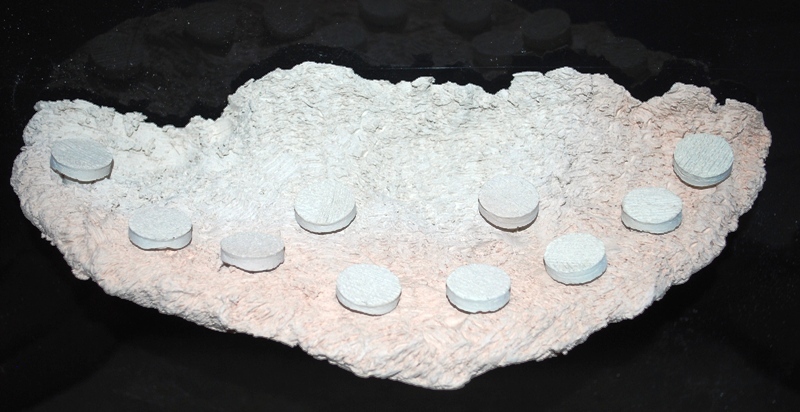 They are designed to sit flat on the bottom of your tank but can easily be mixed in with your rockwork. 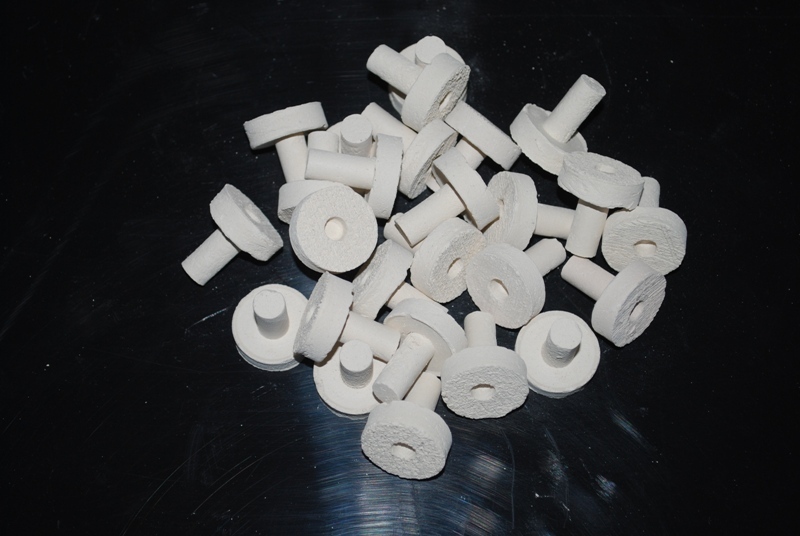 They are made of the same material that we use to make our plugs and disks. While they do not need to cure understand that it is a clean surface. The station does go through a cycle. 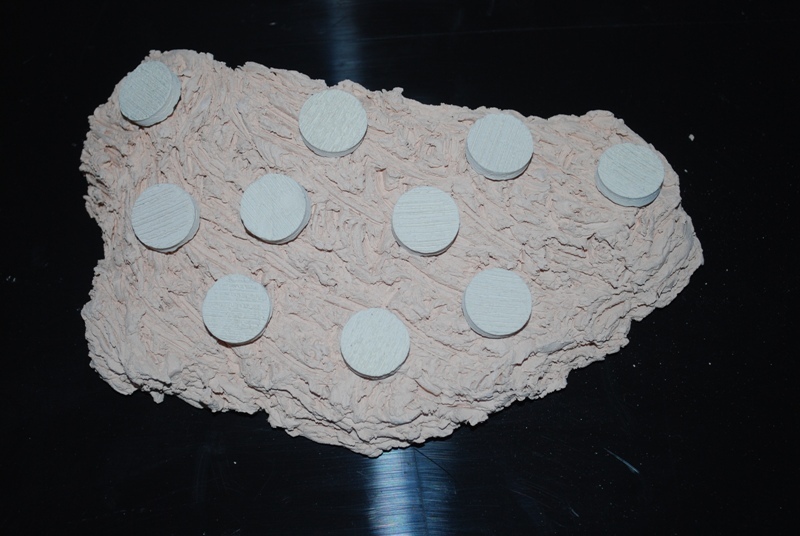 It is very porous and should aid in biological filtration over time. If you have an aquarium with lots of coralline growing the Frag Station will quickly become coralline encrusted as well. Plugs are included with the Frag Station. Magnetic Frag Stations come in three sizes. Small, medium and large. Same features as our Frag Station but with a magnet added to them so they can be mounted to the side of the aquarium. These are sold by size and not hole count. Smalls will have four or more holes and in most cases will have room for additional coral frags not on plugs. Mediums will have up to ten holes and larges will have up to 20 holes. Sizes vary and no two are the same. Small and medium sizes are single shelved. Larges can be single or multi-shelved. 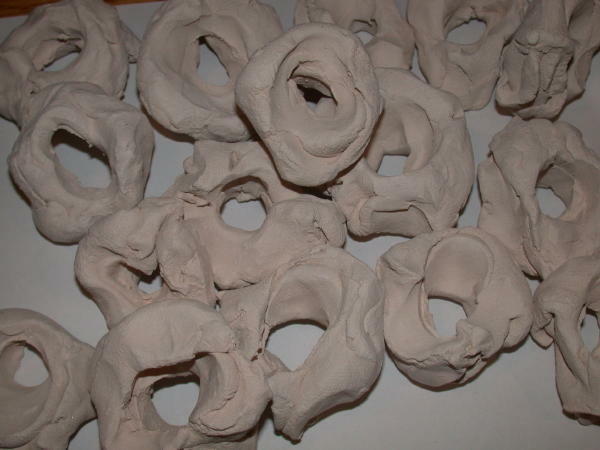 They are solid ceramic and will not crumble or fall apart. It is very porous and in time will act similar to liverock. Frag Plugs are included. We utilize very strong magnets designed specifically for aquarium use. These are not the inexpensive hobby magnets you may find online. The Magnetic Frag Stations are recommended for aquariums with up to 1/2" glass or acrylic. We have tested them on 3/4" thick acrylic aquariums and they hold just fine. However you must use caution and load test every coral you place on theMagnetic Frag Station. We are not responsible for any damage caused by overloading the Magnetic Frag Station. Also extreme caution must be used when attatching the magnets to the aquarium. They can cause injuries and potentially damage the aquarium if allowed to snap together. We are not responsible for any damage or injury due to mishandling of the magnets. We utilize very strong magnets designed specifically for aquarium use. These are not the inexpensive hobby magnets you may find online. The Magnetic Frag Stations are recommended for aquariums with up to 1/2" glass or acrylic. We have tested them on 3/4" thick acrylic aquariums and they hold just fine. However you must use caution and load test every coral you place on the Magnetic Frag Station. We are not responsible for any damage caused by overloading the Magnetic Frag Station. Also extreme caution must be used when attaching the magnets to the aquarium. They can cause injuries and potentially damage the aquarium if allowed to snap together. We are not responsible for any damage or injury due to mishandling of the magnets.